I talked to my buddy Luis the other day. He used to work for a company that creates audiobooks. He did the recording, editing, etc. Recently, though, he’s been doing something entirely different. He partnered up with another friend of mine to start doing music videos for artists. Specifically, they’re working on creating “lyric videos.” These are really cool videos that many artists incorporate into their live shows. Luis told me they were recently contracted to do some lyric videos for an up-and-coming country artist. Once those are finished, there’s a good chance they’ll be doing videos for one of the big-name country artists. You might be one random gig away from discovering something you’re truly passionate about (and truly good at). If you subscribe to the “I’m going to be picky about what projects I work on” mentality, you might miss out on something incredible. If Luis had said, “I’m an audio guy. I have no interest in video stuff,” he would have missed out on what might be an incredibly successful (and fulfilling) career path. What projects are you shooting down without giving them a chance? Who knows, maybe that pop-punk-polka band who contacted you last week is your ticket to something new and awesome. Don’t be too quick to turn it down. 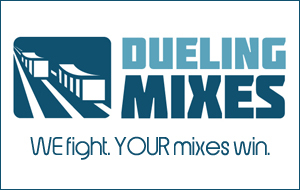 That’s the vibe over at Dueling Mixes, too. You may not “like” the genre we’re mixing on a given month, but there’s a lot to learn from putting in the work.